We're only a couple of weeks into September, but those long, hot summer days already feel like a lifretime ago and the nights are getting noticeably longer and colder - it's time to think about turning the central heating back on! The trouble is, after taking a break for the summer, your system might not be working as efficiently as it should be. If your radiators aren't heating your home properly, it could be because air bubbles are trapped in the system. These bubbles stop the normal flow of the hot water and leave you with a colder home and higher energy bills. 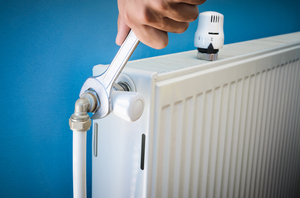 Turn on your radiators and wait until they are fully heated. Be careful and do not burn your hands. If the radiator is cool at the bottom and hot at the top or it is not distributing heat evenly, it might be due to trapped air. Don't worry, it a common issue and can be fixed under half an hour. Your radiators just need bleeding. Always turn the heating off before you start bleeding your radiators - if you leave it on, more air can be pushed into the system, and cool radiators are easier to handle. Next step is to find a radiator valve. 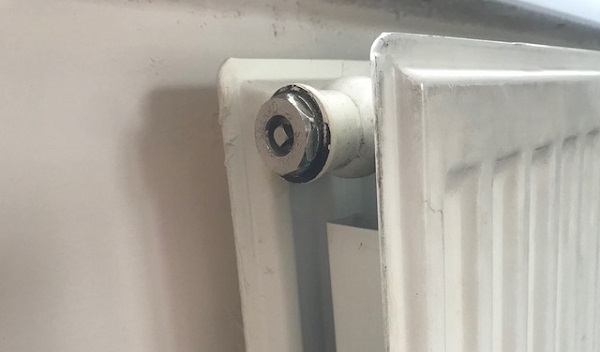 Radiator valves can be found at the top corners of the heaters as per the picture below. The final step is to check whether the boiler pressure is at its adequate level. What pressure should your boiler be at? When the heating system is cool, the indicator should be in the green section and the pressure should be between 1 and 1.5 bar on the pressure gauge. If pressure is below 0.5 bar, and the indicator is in the red section, water has been lost from the system and must be replaced. If it is below the optimal level you will need to repressurize the system. If you need to increase the pressure and top up your system, you'll need find the filling loop - a sliver/grey flexible hose with a small valve at each end, which is usually found underneath the boiler. Open both valves, using the tap handles or a flat-headed screwdriver, to allow cold mains water into the system. You should be able to hear it filling with water. Keep a close eye on the pressure bar, once it reaches the required level of between 1 and 1.5 bar, close both valves, one afetr the other. With the pressure now at the optimal level, you cna switch the boiler back on and turn on the radiators, which should now be heating evenly and efficiently. You should also check for any unexpected leaks and make sure heat is being evenly distributed across the heating panel. If there are any leaks, make sure you've tightended the valves properly. If the leaks persist, or the heat still isn't spreading evenly across the radiator, you should call your local plumber to take a look.